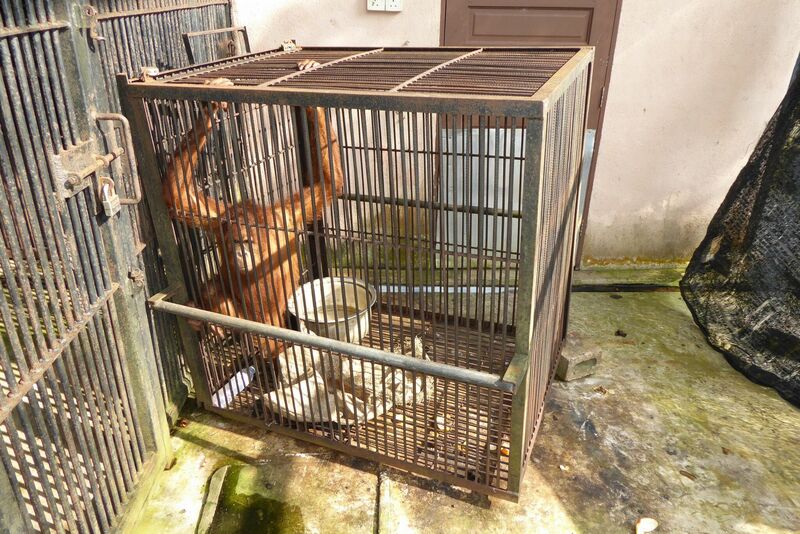 Prominent Malaysian animal rights activists say that conditions at Kemaman Zoo in Terengganu are appalling. Members of the NGOs Malaysian Friends of the Animals and Friends of the Orangutans (Foto) have recently provided photographic evidence indicating that several resident animals, from orangutans to elephants, were being neglected and mistreated at the zoo. Not so, retorted officials of the Department of Wildlife and National Parks (Perhilitan). Claims of animal abuse at Kemaman Zoo have been exaggerated and based on a “misunderstanding,” a senior wildlife official stressed. Case closed then? Not according to animal rights activists. That explanation does not wash, however, notes Carol Buckley, a world-renowned elephant expert from the US. 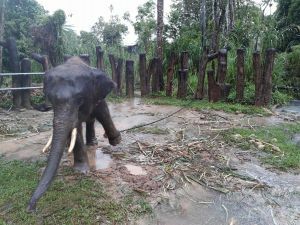 “From the design of the exhibit, it appears they mistakenly assumed the young male elephant would remain contained,” Buckley said in an interview with Foto, which has passed her comments on to Clean Malaysia. “But the design is inferior, resulting in the elephant being chained. Poor planning is consistent with many zoos. The weaving [of the chained calf] is an indicator of poor welfare, [demonstrating] the elephant’s coping mechanism in response to stress,” she added, referring to a video that showed the young calf swaying from side to side with one of its legs held by a chain tied to a log. The same concerns apply to the situation of the orangutans kept at the zoo, including an infant, observes Upreshpal Singh, director of Foto. “According to a Kemaman Council secretary the baby orangutan had to be separated from his mum due to medical reasons and that the mother tends to mate with her baby,” Singh tells Clean Malaysia. “However, no baby orangutan should be kept in such an atrocious tiny cage. We have been sent photos from November, December and January to show the baby kept in the same cage,” the animal rights activist explains. Other animal rights activists have been even more scathing in their condemnation of wildlife officials who, they say, have been turning a blind eye to violations to animal welfare at Kemaman Zoo and similar establishments across Malaysia. “Reports last week of the Wildlife Department finding nothing wrong with conditions animals are held in at the Kemaman Zoo only serve to reinforce the general perception these government officials always find in favour of zoos,” Sean Whyte, chief executive officer of the conservationist group Nature Alert, stresses in a letter to the editor apropos of the official denials. That statement should hardly come as a surprise to anyone who has visited Malaysian zoos where the standards of animal welfare tend to remain demonstrably subpar by modern standards. As likely as not, you will see a myriad of animals cooped up in tiny dingy cages with few or little enrichment tools and fed on inadequate diets. Majestic animals like orangutans, tigers, elephants and sun bears are often reduced to languishing in abject conditions for years on end without a reprieve. If zoos kept human beings in similar deprivation, they would be condemned as little better than maximum-security prisons that doubled as houses of horrors. To make matters worse, highly social animals like elephants and primates are often kept singly for long periods, which is a form of solitary confinement for them. In the same vein, animals are often deprived of even the most basic opportunity to express their natural behaviors. “One example. 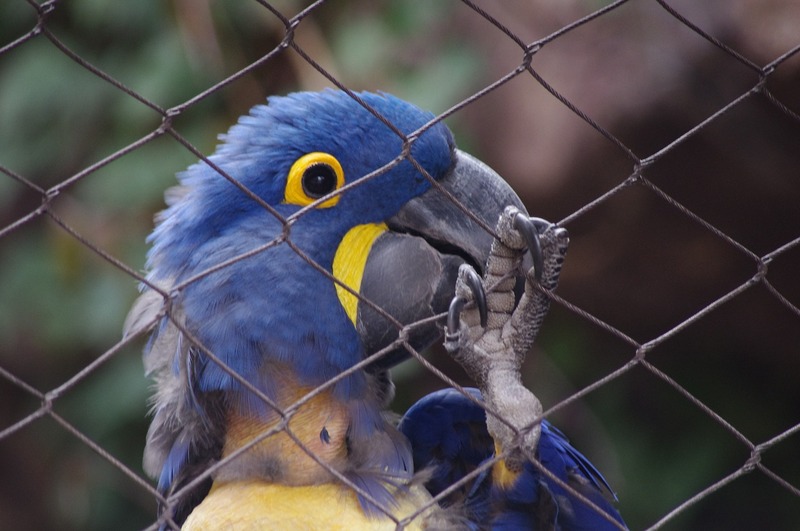 How many birds are kept in cages that prevent them from flying?” Whyte offers. “Birds have wings, for flight. Depriving them of the ability to fly and experience natural stimulus is a breach of Malaysian law. How many zoos have their own veterinarians with experience in wild animals? It is a legal requirement,” he elucidates. “Given that most zoos appear not to care about the cruelty their birds and animals suffer and [given] the Wildlife Department’s constant defence of bad zoos, if readers do not want to be complicit in this suffering, the very best and easiest thing to do is to stay away from all zoos,” Whyte surmises. Clearly those in authority have inspected their facility with their eyes closed. Or is it their comments are to save face rather than admit their animals are suffering dreadfully from neglect and I think cruelty. Wake up Malaysia. Your zoo is nothing to be proud of. If you really cared you would in consultation with animal welfare groups address each issue to ensure the animals are housed and treated properly. Publicity on zoos has once again resurfaced and this time the focus is on the Kemaman Zoo, Terengganu. 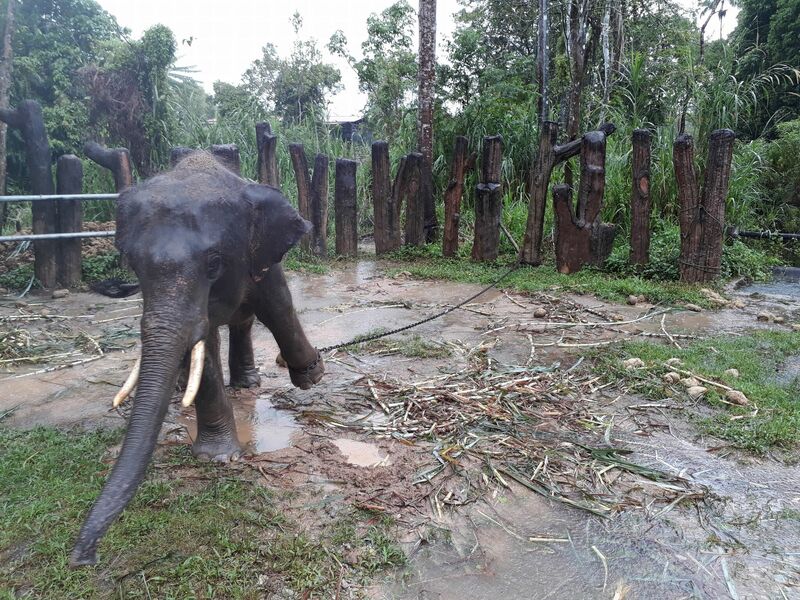 Allegedly disgruntled Kemaman zoo employees shared photographs of animals in tiny cages, and an elephant chained outside in the rain, with animal welfare activists. 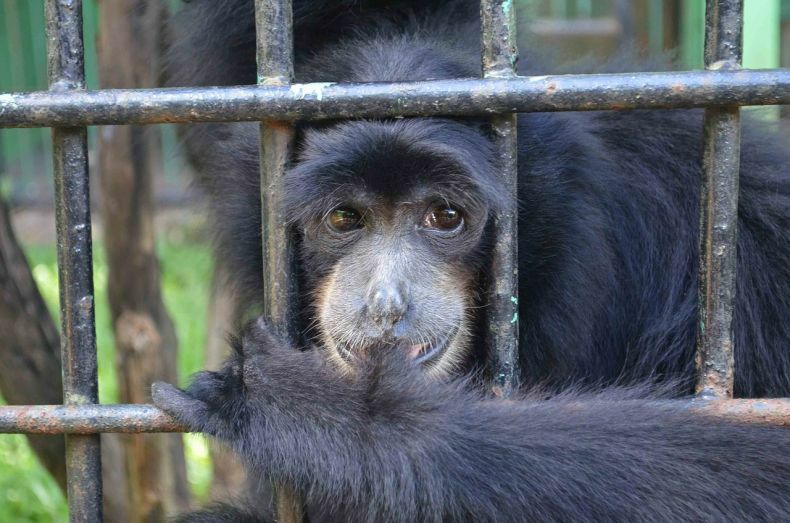 The zoo pictures shown in social media speak volumes of the way in which animals are kept. Despite their professed concern for animals, zoos can more accurately be described as collections of interesting animals than as actual havens or homes. Even under the best circumstances at the best zoos, captivity cannot replicate wild animals’ habitats. The wild may not be an idyllic place free from problems, but animals have evolved over thousands of years, adapting to live in certain types of natural environments. Placing an animal in surroundings that are unsuitable for the species can cause stress and behavioural problems. Sahabat Alam Malaysia (SAM) believes its best not to keep wild animals at all if their needs cannot be met, particularly if the animal is there for entertainment. .
Presenting animals to zoo visitors as living trophies teaches children that animals can be manipulated in order to fulfil their own curiosity. Zoos teach people that humans have the right to enslave animals, and reinforces the notion that animals have no other purpose than for our benefit. The disturbed and often bizarre behaviour of animals in zoos provides further evidence that holding animals in captivity is wrong. Zoos fail to recognise that animals have their own needs to be met, for their own purposes. Zoo officials should stop kidding themselves about the tremendous educational value of showing an animal behind a glass wall or in metal cages. It does not matter what is on display – people treat the exhibits as wallpaper. The alleged ‘educational’ role of zoos needs to be challenged if society is to have respect for animals. What is unquestionable is that the majority of Malaysia’s odd zoos are run for little more than profit or entertainment; and the conditions within most are rarely above mediocre. It is time to assess how animal exhibitors licensed by the federal government are complying with minimum animal welfare standards. The current system of licensing and inspection does not ensure that our zoos meet and maintain, let alone exceed, the minimum animal welfare standards. SAM urges the Natural Resource and Environment Ministry and the Wildlife Department to cease the granting of permits for opening of new zoos. Instead, they should focus on sub-standard zoos to ensure they meet exacting standards of housing, husbandry, welfare, and health for all their inhabitants.